Brown rattan & bamboo basket with dinner service for 2. The exquisitely handcrafted Romance picnic basket was designed for the picnicking elite. The unique, original design is functional as well as elegant. The basket is made from brown rattan and bamboo, and it is fully lined with quilted cotton. 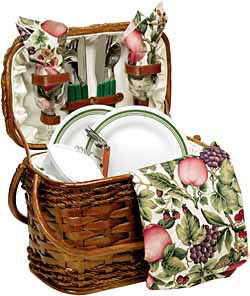 This stylish 14" basket includes all the amenities needed for picnic service for two. Ideal for any gift giving occasion! 2 plates (melamine 9"), a plastic food container, 2 wine glasses (8 oz. ), 2 napkins (cotton 14" x 14"), 2 each stainless steel knives, forks and spoons, tablecloth (cotton 45" x 45"), waiter style stainless steel corkscrew. Cloth patterns may vary.